I am a sucker for yummy smelling body products. Showers are a daily thing (well, for me they are...no judgement) and it might as well be an enjoyable experience, amiright? I still keep my holy grail body wash from Dove close by, but I like to experiment with different scents and textures both in the shower and when I get out. 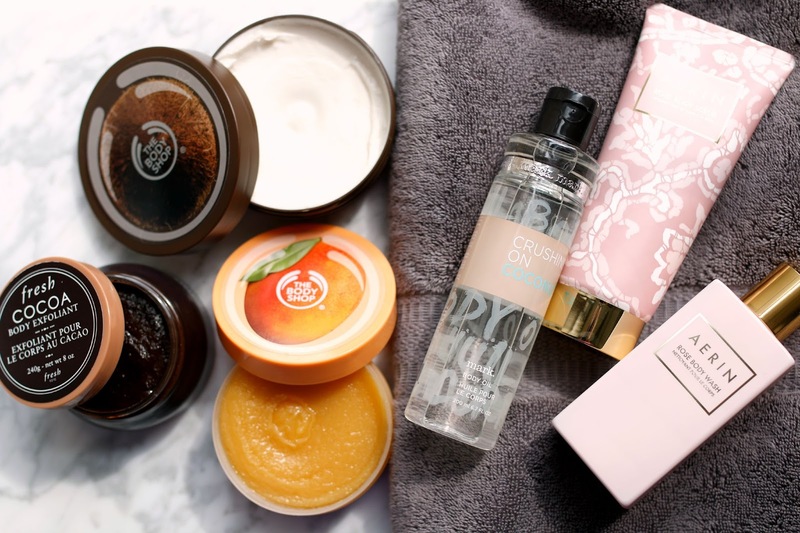 These are 6 products that smell heavenly - ranging from sweet and delectable to delicate and feminine. 1. .mark Coconut Body Oil - I already fell in love with this body butter from .mark, so I was pretty positive I would enjoy this body oil. But I should warn you that if very sweet scents are not your bag, this may not be for you. The sweeter the better for me, and this body oil is as sweet as it gets. It is a strong coconut scent that has hints of a cake batter-like note in it which can really go one way or another. Luckily, it isn't too overpowering and when on the skin smells incredibly pleasant. But the real winning feature with this body oil is how it feels on the skin. I apply it right out of the shower while my skin is still wet, and it instantly absorbs with absolutely NO RESIDUE. And at a price point of $12.00, it's a total steal! 2. 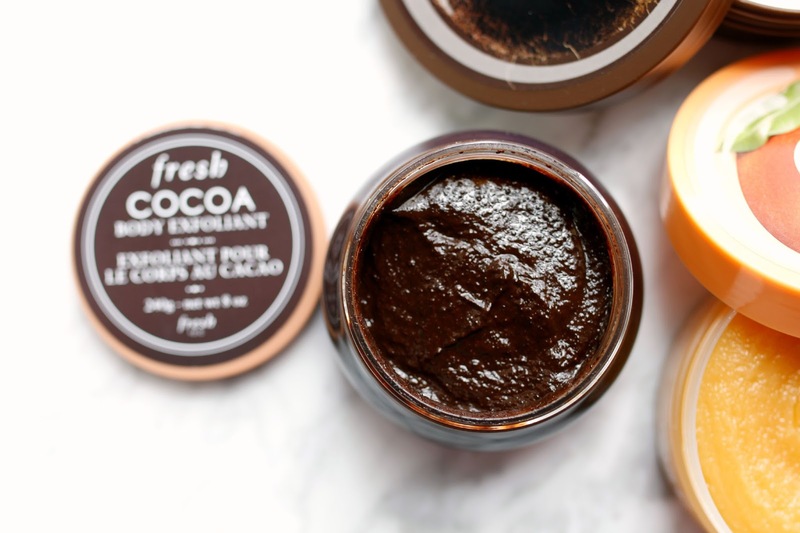 Fresh Cocoa Body Exfoliant - I saw this on Instagram first and nearly fell out of my office chair. I could not get my hands on it fast enough. The Fresh Beauty team kindly sent one over to me for review, and I actually opened the bag, took off all my clothes, and took a shower immediately. I was THAT excited. Yes, it smells exactly as it looks. Like a decadent batch of brownie batter made from the richest cocoa around. Only a little bit is needed to cover most of the body, but it gives a nice gentle exfoliation. The granules are quite small so I can get away with using this multiple times a week if I wanted, and my skin is never irritated. 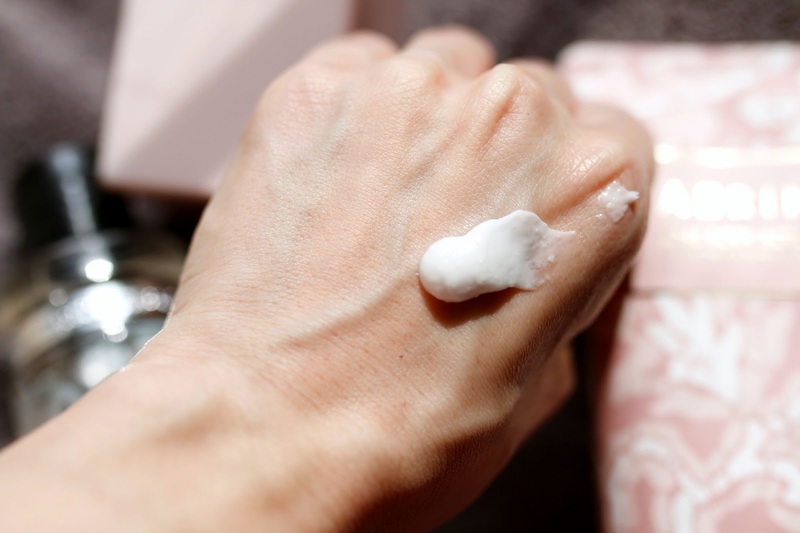 From a scent standpoint, it does not linger on the skin after the shower so I was able to use my regular body lotion on top without any problems of competing scents. The only caveat is that your shower will need a complete rinse-down after using this because there will be chocolate splatters everywhere! Ha! But trust me, it's worth the extra housework for how decadent you will feel using this. 3. 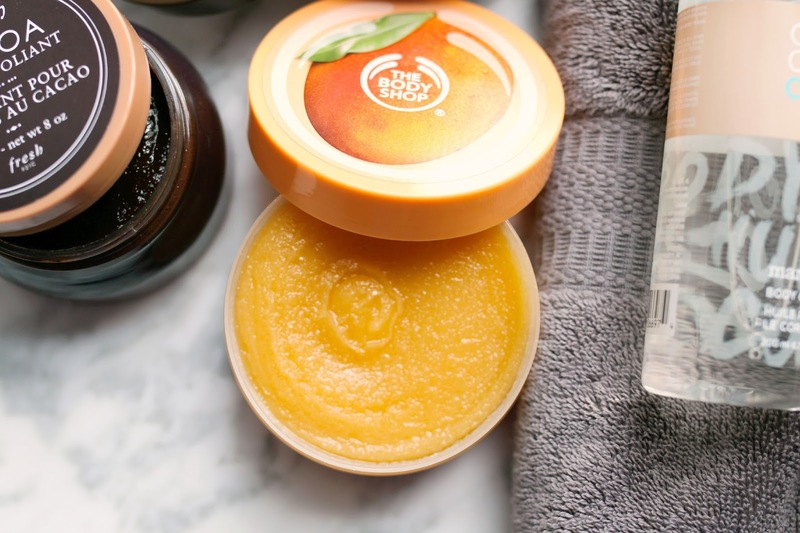 The Body Shop Mango Body Scrub - Another delectable scrub that will make you yearn for a tropical vacation each time you shower. The texture is much thicker than the Fresh Cocoa and definitely gives a strong exfoliation. The scent smells like a yummy mango dessert and thankfully does not leave any oily residue in the tub as many body scrubs can do. Once you rinse it away, the scent does not stay on the skin but if you wish to continue your tropical fruit salad experience, there is the mango body butter you can add on once out of the shower. 4. 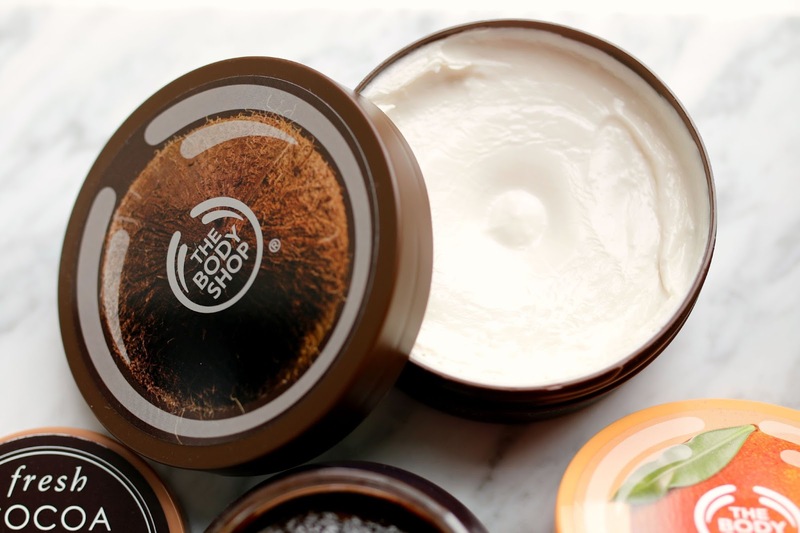 The Body Shop Coconut Body Butter - Continuing on that tropical vacation theme, this Body Shop Coconut Body Butter will most certainly make you feel like putting on a bathing suit. Well, at least your sunglasses. I have heard amazing things about The Body Shop Body Butters so I was excited to finally try one for myself. They are incredibly rich and nourishing, melting into the skin with little to no rubbing. I prefer to use this at night as a moisturizing treatment before bed. After a quick relaxing shower, I apply this while my skin is slightly damp, massaging it in and then wait a few minutes before getting into my pajamas. However, I usually follow my evening shower with my skincare routine so I use those few minutes to let the body cream sink into my skin. While the scent is quite strong in the tub, it actually wears nicely when on and doesn't overpower. 6. Aerin Beauty Rose Body Wash - I can use this in conjunction with the body scrub or alone, either way it gives a nice lather and makes my skin feel incredibly clean. The texture is a traditional gel, and I like to pour it onto a washcloth or loofah to get a nice lather which feels a bit more luxurious. Like my face washes, I am not the biggest fan of foaming anything but my skin doesn't feel tight or dry after using this so this falls in my "foaming but not drying exception" category. And the scent lingers even more than the body scrub so I can go without a fragrance for the day if I want. But I love perfume too much for that. If you get a chance, you should try LaLicious body scrub. Amazzzzzzzing. My favourites are the Korres line for beautiful smelling showers. But I must get my hands on the Aerin as I have the matching hand cream and it's to die for.